Recently I’ve become increasingly concerned that one of Fist Fam producer Al Lover’s family members has been kidnapped by some archfiend that is using that loved one’s life as a bargaining chip in some sort of nightmare “Speed” meets “Hustle & Flow” scenario, in which Al is forced to perpetually make beats at an alarming pace or the ticking time bomb will explode. And that if you go to his apartment you will find him hunkered over his MPC in some frayed, coffee-breathed condition continually muttering the phrase “cant’ sleep… must make beats”. Or not, that’s just the only way i could justify the amount of music this guy is putting out. 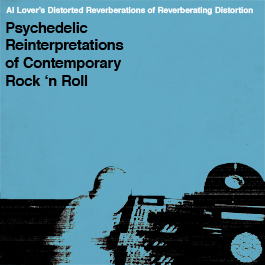 Here’s a link to another instrumental album of “psychedelic reinterpretations of contemporary rock & roll” or more conveniently, “garage-hop” for free down load from Cool Al Lover. Who recently produced the entirety of the Fist Fam’s last full-length “Posted”, Gus Cutty’s double single All Mine/Part of the Game, as well as several other instrumental discs.